보천교 다시 보다 / 노 종상 [and six others]. 5.18 10일간 의 야전 병원 : 전남 대학교 병원 5.18 민주화 운동 의료 활동집 / 조 영국 [and many others]. 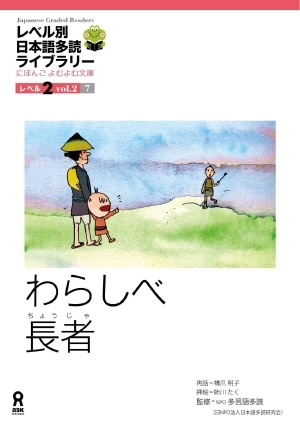 家族の秘密 / セルジュ・ティスロン著 ; 阿部又一郎訳. Nepālako lokakathāsaṅgraha / Karuṇākara Vaidya. Kavi Bhānubhaktako jīvanacaritra : bhaktamālā, praśnottaramālā, vadhūśikshā ra phūṭakara racanāharūsahita / Motīrāma Bhaṭṭa, Sūryavikrama Jñavālī. Vīra caritra : pahilo Nepālī upanyāsa / Girīśavallabha Jośī. Birsiekā satya : upanyāsa / Numeśa Ghartī Magara. Sipāhīko jindagī / Cinīyābahādura Basnyāta. 希望之旅 : 挑戰歧視及傳承溫哥華唐人街的歷史文化遺產 / 作者, 余全毅 ; 編輯, 凌慧意, 沈思, 黃永安 ; 翻譯, 沈思. 花葉婆娑 : 華盛頓大學和不列顛哥倫比亞大學古籍珍本新錄 / 沈志佳, 劉靜主編. Come and celebrate the Year of the Pig with the Asian Library and the Department of Asian Studies on Friday February 8 at the Nest Atrium Lower Level. Enjoy wonderful performances and participate in interesting cultural activities. It is free and open to the public! Drop by our Pop-up Library booth between 11:00 am and 2:00 pm. We will feature our Great Reads Collection and language learning materials. 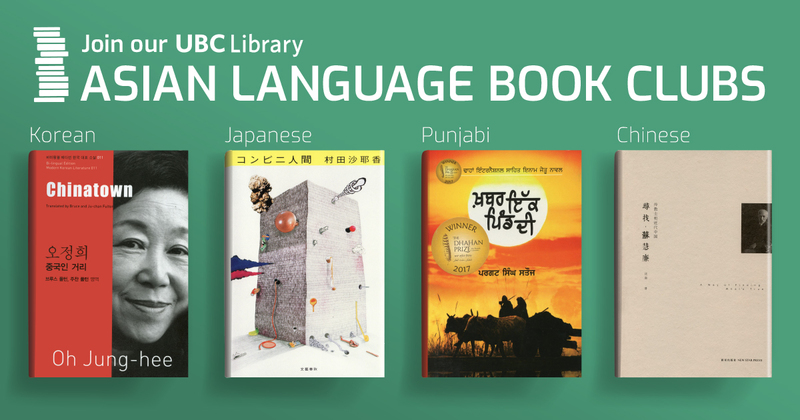 You can also test your knowledge on the Lunar New Year and the UBC Library. Same as the past years, all visitors to the Asian Library booth will receive a pocket of luck (while quantities last)! The celebration organized by the Department of Asian Studies will run from 11:00 am to 4:30 pm. Performances include lion dance, Korean drumming, K-pop dance, and Chinese music, etc. They also offer hands-on activities like Chinese calligraphy, seal engraving, Cantonese Mahjong, Ring Toss, and more. Check out more details HERE! 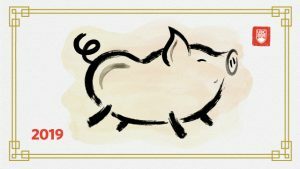 The Asian Library would like to wish everyone a happy and prosperous Year of the Pig. We look forward to seeing you on February 8! The Library will continue to subscribe to vital electronic databases for Korean Studies thanks to a generous e-resources grant from the Korea Foundation. This database covers over 2 million full-text articles from more than 2,000 scholarly journals covering subject areas such as Business, Economics, Humanities and Sociology, Linguistics, Education and Religions. This database provides full text access from over 3,285 journal/thesis titles and access to the Choson Ilbo Archive (newspaper articles since 1920). It covers subject areas such as Korean language and literature, History, Education, Law, Medical and Engineering. This is a full text database for Korean Studies covering history, literature, dictionaries and traditional medicines. For more information about these databases, please contact Lucia Park, Korean Language Librarian, at lucia.park@ubc.ca. 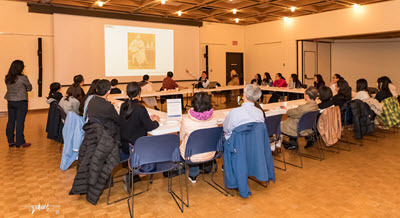 The Department of Asian Studies and the Asian Library at the University of British Columbia are pleased to announce the 2019 essay competition in Punjabi for Punjabi language students, in association with the Harjit Kaur Sidhu Memorial Program at UBC. 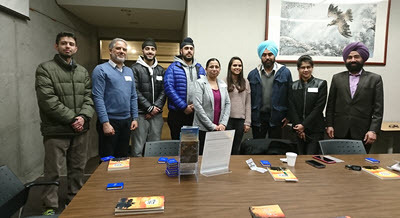 Students who were enrolled in a Punjabi language class or classes at a university, college, or at the pre-collegiate level in B.C. during the last three years (2016/17, 2017/18, 2018/19) can participate in this competition. Beginner’s level: What is the importance of recycling? Advanced level: Discuss the pros and cons of social media? Beginners: For those students who have completed or who are enrolled in the first-year level of Punjabi at a university or college or grade 8 to 11 in a high school in B.C. Students at this level should write a 400 – 500 words essay on the above topic. 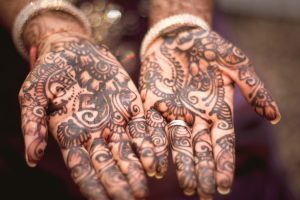 Advanced: For those students who have completed or who are enrolled in a second year or higher-level Punjabi course at a university, college, or in grade 12 in a high school in B.C. Students at this level should write a 800 – 1000 words essay on the above topic. One winner will be selected from each category and will be given an award of $200.00; one runner-up will be selected in each category, who receive an award of $50.00. These awards will be presented at a function in Liu Institute, at UBC, Vancouver on the evening of March 14th. Those students who are currently enrolled in Punjabi classes can submit their essays to their teachers (who are then responsible for submitting them by the deadline); other students can forward their essays to the address given below. All submissions must be received on or before March 1st. No exceptions will be made. For further information, please e-mail Sarbjit Randhawa, South Asian & Himalayan Studies Librarian, at sarbjit.randhawa@ubc.ca. 하루 중 제일 달콤 한 우리 가 함께 걷는 시간 / 글, 그림 이 규영. The UBC libraries are closing early on Christmas Eve. Please come to the library early if you plan to borrow items for your holiday reading. Monday December 24: 9 a.m. – 3 p.m.
Normal hours resume on Wednesday January 2, 2019. For more information on UBC Library hours, please visit Hours and Locations. 한국인 의 원형 을 찾아서 / 박 상하 지음. 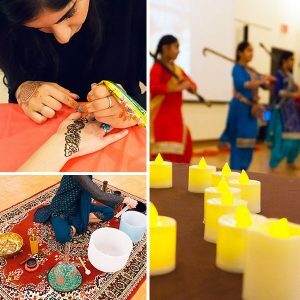 On October 26, the Asian Library hosted an early Diwali (Festival of Lights) or Deepavali celebration – the most widely celebrated festival in India and throughout South Asia – in partnership with the Centre for India and South Asia Research, Department of Asian Studies, and South Asian Canadian Histories Association. There were about 100 participants who enjoyed the tasty samosas, Khadija Bhatti’s henna painting, Klara Milada’s mantra singing and crystal bowl playing, a Hindi song by Raghavendra Rao K.V., a Research Associate from the Institute of Asian Research, a Punjabi song by Gurinder Mann, and Bhangra by the dancers of Gurdip Art’s Academy. Sarbjit Randhawa, South Asian and Himalayan Studies Librarian, would like to thank Dr. Anne Murphy, Associate Prof. for Punjabi Language, Literature and Sikh Studies for her continued support to the Asian Library, and Shirin Eshghi, Head of the Asian Library, for her ongoing support and encouragement. 중국 산동 지역 의 동이 / 동북아 역사 재단 한중 관계 연구소 편 ; 박 선미 [and seven others]. 귀신 과 괴물 : 조선 유교 사회 의 그림자 / 강 상순. 광복 70년, 독립 운동사 연구 의 성과 와 과제 / 기획, 편집 박 한남, 김 광운. 兩岸情緣30年 / 習賢德编著 ; 田申策劃. The Asian Library will close at 5:00 p.m. Monday to Saturday from September 4 to accommodate upcoming upgrades and renovations. The renovations, scheduled to be completed in the Spring of 2019 will allow for improvements to student study areas, seminar space and programming. Thank you for your understanding as we continue to improve spaces and services for faculty, students and the community. Any questions about the renovation can be directed to Shirin Eshghi, Head, Asian Library. 근대 지식 과 역사 의 발견 : 신 채호 의 역사 서술 을 중심 으로 / 김 수자 지음. 한반도 이념 전쟁 연구, 1919-1950 : 빨갱이 와 반동 분자 / 한 상철 지음. 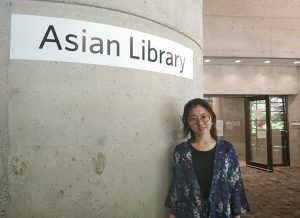 Yifei Zhang (张艺菲) is the summer intern student at the Asian Library this year. She will work from July 3 to August 3 under the supervision of Jing Liu, Chinese Language Librarian. Let’s learn more about her. Give a brief introduction of yourself. I am Yifei Zhang from China. I worked for four years in government department and involved in routine archive management and financial affairs. I am currently a Master student studying in the Library and Information Management program at the University of Hong Kong. Why are you interested in the internship with the UBC Library? 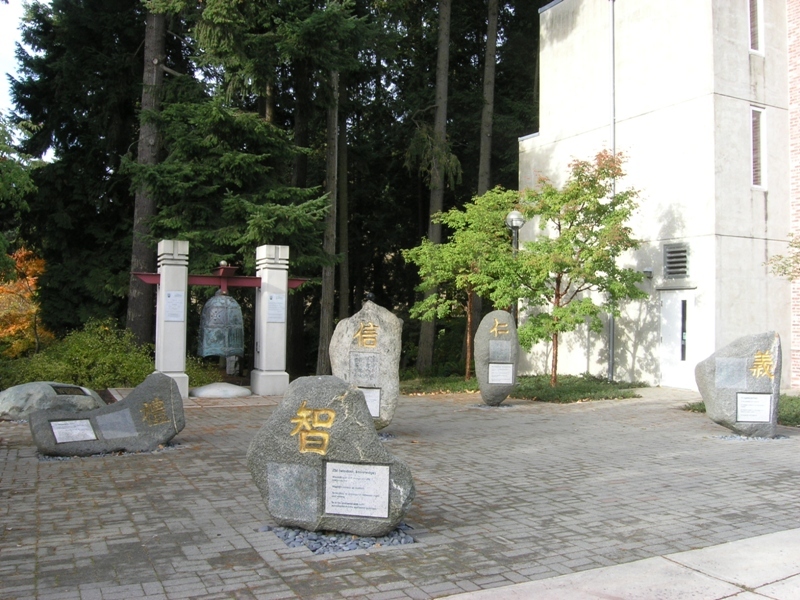 UBC Library is one of the largest academic libraries in Canada, and the Asian Library houses the largest research collection in Asian languages in North America. Internship in such an excellent academic library can help me to get not only about the most advanced academic library management experience, but also allow me to understand how Asian culture is transmitted through the library. 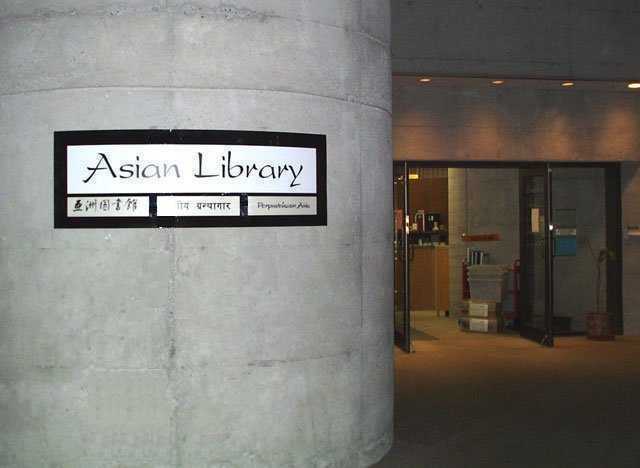 It is worth mentioning that the architectural features of Asian style and the beautiful working environment are also why I am interested in the UBC Asian Library. What are your expectations towards this five-week internship? I hope to acquire more practical work experience in this multicultural library and further develop myself in the field of modern academic librarianship through understanding the outreach activities and inter-relationships of the different functional groups in library, understanding the role of librarians and learning the current trends in academic libraries. UBC Asian Library is please to announce that Sarbjit Kaur Randhawa, who has worked in a part-time capacity as our Indic Librarian for the past twelve years, has transitioned to a full-time role as our South Asian and Himalayan Studies Librarian. Sarbjit graduated from UBC’s School of Library, Archival and Information Studies (currently UBC iSchool) with a Certificate in Advanced Study (CAS) in 2005, and joined the Asian Library in the same year. 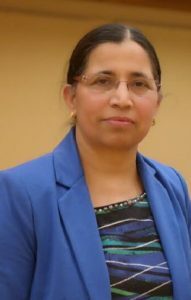 Sarbjit is also a graduate from Guru Nanak Dev University with three Master degrees including a Master in Library and Information Science (MLIS), a Master in Religious Studies, and a Master of Arts in Punjabi. She is fluent in various South Asian languages including Hindi, Punjabi, Sanskrit and Urdu. Along with her co-researcher Aditi Gupta of the University of Victoria Libraries, Sarbjit is the recipient of American Library Association Diversity Research Grant for 2015-16. Their research is based on exploring library perceptions, reading habits and library usage of the South Asian population in BC. She was awarded the prestigious 2014 Dr. Mohinder Singh Randhawa award for promoting and sharing South Asian language and culture, and preserving its collections through her community-outreach and library services. Sarbjit has a passion for poetry, and many of her poems have been published in several newspapers and magazines. Congratulations Sarbjit! We are lucky to have you at Asian Library, and look forward to working with you in a full-time capacity! 마이스 (MICE) 산업 : 한눈 에 보기 / 편집인 이 창림 의회 정보 실장 [and three others]. 최저 임금제 한눈 에 보기 / 편집인 임 재주 의회 정보 실장 [and four others]. 주택 임대차 보호 : 한눈 에 보기 / 편집인 이 창림 의회 정보 실장 [and four others]. Mr. Yim Tse (謝琰), Chinese Librarian (1968-1999), passed away on March 16, 2018. Asian Library has set up a book display at the Asian Centre entrance in memory of this pioneer librarian and friend. Born in Hong Kong in 1936, Yim Tse graduated from the University of British Columbia and received a graduate diploma in librarianship from the University of Strathclyde, Glasgow, Scotland. He began to work at the UBC Asian Library as Chinese Librarian in 1968 and served until his retirement in 1999. For more than 30 years of service, Yim was highly respected by UBC faculty and students for his knowledge and in-depth reference support. He and his family are also devoted supporters of UBC. In addition to his contributions as a librarian, Mr. Tse was a renowned calligrapher. He studied Chinese calligraphy in his early years under Mr. Lam Chin Shek (林千石) and dedicated himself to studying and creating Chinese calligraphic art. Moreover, he undertook the promotion of Chinese calligraphy as his lifelong calling, and at the same time he played the role as a curator, writer, and translator. Over the years, Yim curated 10 collective and four of his own solo Chinese calligraphy exhibitions, as well as published and translated a number of books. Many of his works were shown in exhibitions and collected by the Canadian Museum of History, UBC, Art Gallery of Greater Victoria, International Buddhist Temple in Richmond, BC, and Nankai University located in Tianjin, China. 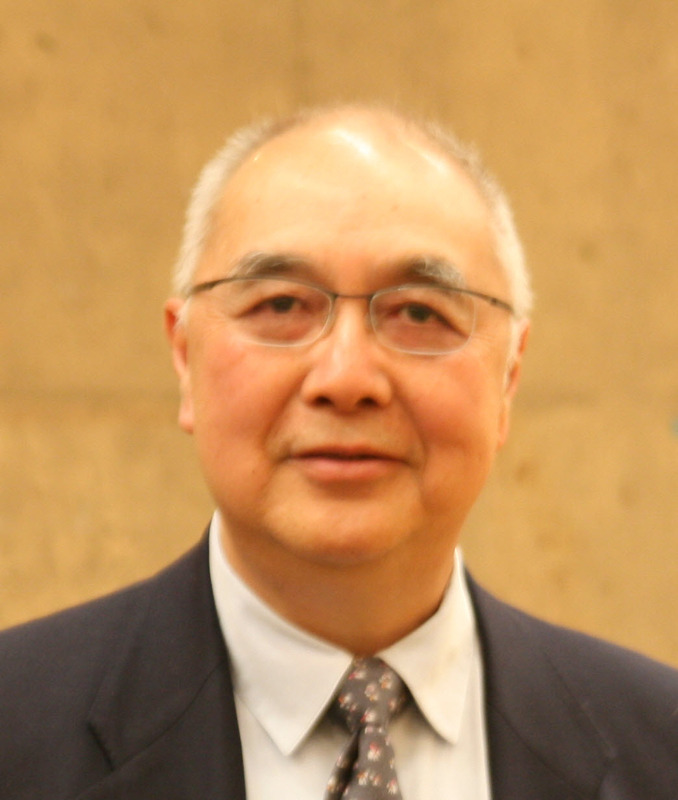 The UBC Library is sad to announce that Mr. Yim Tse, the former Chinese Librarian with Asian Library, passed away on March 16, 2018. Prior to his time as Chinese Librarian, Mr. Tse worked as both a Student Assistant and Library Assistant with the Asian Library. In 1968 Mr. Tse took on the position of Chinese Librarian, a post he held until his retirement in 1999. Mr. Tse was highly respected by UBC faculty and students for his knowledge and in-depth reference support. In addition to his contributions as a librarian, Mr. Tse was also a devoted supporter of the UBC library. Over the years, his family has donated to the Basil Stuart Stubbs Book Prize Fund, the Asian Library Renovation Fund and the Rosa Wai Wai Ho Scholarship in Asian Studies. 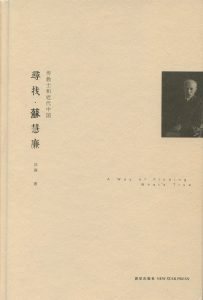 His gift-in-kind donations are important research materials to the Chinese collection in the Asian library. The Asian Library will undergo extensive renovations to its top and main floors starting in the Spring of 2018 that will allow for improvements to student study areas, seminar space and programming. Beginning March 1, access to the upper floor of the Library will be restricted. Essential items in the library’s collection have been relocated to the lower floor to facilitate use, while all other material has been moved off-site and will be inaccessible for the duration of the construction, expected to be completed by early 2019. Once construction is complete, material selected to return to the library will be returned gradually. Low-use material will be re-directed to PARC, our on-campus storage facility where they will continue to be available for check-out. Items moved out of the library will start to be available either back at the branch or in PARC by early 2019, with access to the full collection expected by summer of 2019. Users requiring access to materials moved off-site are encouraged to use InterLibrary Loan in the interim. 「うつわ」を食らう : 日本人と食事の文化 / 神崎宣武. UPDATE: Thank you for your participation! 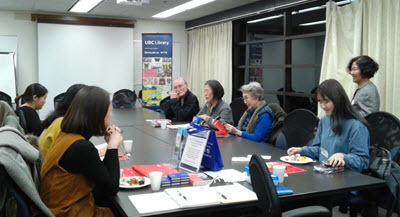 If you are interested in future Chinese book club events, please email your name and contact information to the Asian Library at asian.library@ubc.ca. $10 per person, including a copy of the book and light refreshments at both sessions. Spots are limited. Please register early. 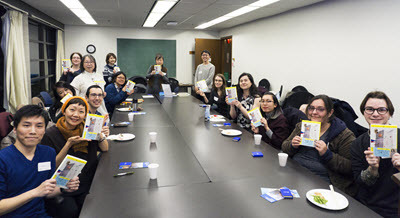 This book club will be of special interest to current students, staff and faculty, alumni and community members who have studied Chinese at an advanced level. 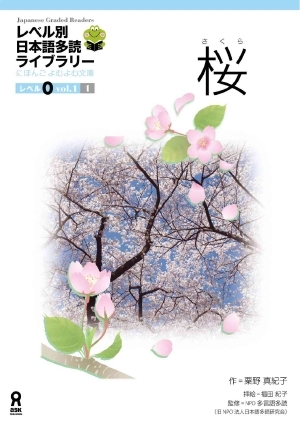 We will be reading 寻找苏慧廉 A Way of Finding What’s True written by 沈迦 (Shen Jia). This biography describes the life of William Edward Soothill, a British missionary to China who later became a Sinologist and Professor at Oxford University. Soothill spent the majority of his adult life in China, a country where his story is little known. Soothill travelled to China in his early 20s and settled in Wenzhou, where his children were born. Over the next 20 years, he built a number of churches, hospitals, and schools in this coastal city. He also learned the local dialect, which allowed him to compile dictionaries and translate the bible. His reputation as a great educator resulted in his appointment as the President of the Imperial University at Shanxi. He then worked in Shanxi for nearly a decade, after which he returned to England and became a Professor of Sinology at Oxford University. While in China, Soothill witnessed the most turbulent time of the nation’s history. His journey illustrates the immense transformation of the country during that period. Shen Jia started this project to document Soothill’s story while in his hometown of Wenzhou. He traced Soothill’s travels across three continents: Europe, Asia, and America. He spent 6 years immersed in archival research and conducting numerous interviews. Using the method of archaeology of knowledge, Shen’s book reconstructs the vivid story of a brilliant China expert. Shen’s work is both a provocative biography and a scholarly text. Its narrative also reflects the intricate history of modern China. Shen Jia, born in Wenzhou, Zhejiang in 1969, took his MA degree at the Zhejiang University and his EMBA degree at the China Europe International Business School (CEIBS). He used to work as a journalist, an editor, and then started his own business. 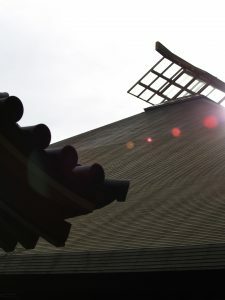 He currently lives in Vancouver, and is focusing his research on the relationship between the missionary movement and modern China. He is the author of Putongren: Jiayitang shoucang zhaji (The Commoners: Notes on the Collections of Jiayitang), Xia Chengtao zhi Xie Yücen shouzha jianshi (Annotation on the Hand-Written Letters Xia Chengtao Sent to Xie Yücen), Xun zhao Su Huilian (A Way of Finding What’s True), and Yitiao kaiwang zhongguo de chuan (A Ship Heading to China). Published in the Mainland China and Taiwan in 2013, A Way of Finding What’s True became a best seller immediately. It was praised as one of “The Best Ten Books” in 2013, and the Phoenix Television made a documentary of the same name according to the content of this book. Questions? 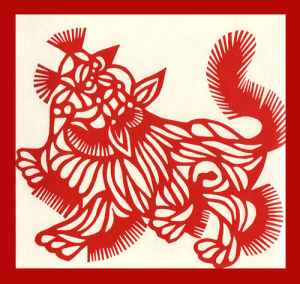 Please contact Chinese Language Librarian Jing Liu at jing.liu@ubc.ca. The Department of Asian Studies and the Asian Library at the University of British Columbia are pleased to announce the 2018 essay competition in Punjabi for Punjabi language students, in association with the Harjit Kaur Sidhu Memorial Program at UBC. Students who were enrolled in a Punjabi language class or classes at a university, college, or at the pre-collegiate level in B.C. during the last three years (2015-16, 2016-17, 2017-18) can participate in this competition. Students can enter in this competition in either one of the following TWO categories, depending upon their level in Punjabi. (Proof of level of most recently taken class is required, or your teacher can submit for you.) Although the topic is the same at the two levels, essays will be judged in accordance with students’ levels according to the two categories. Beginners: For those students who have completed or who are enrolled in the first-year level of Punjabi at a university or college or grade 8 to 11 in a high school in B.C. Students at this level should write a 400 – 500 word essay on the above topic. Advanced: For those students who have completed or who are enrolled in a second year or higher level Punjabi course at a university, college, or in grade 12 in a high school in B.C. Students at this level should write a 800 – 1000 word essay on the above topic. One winner will be selected from each category and will be given an award of $200.00; one runnerup will be selected in each category, who receive an award of $50.00. These awards will be presented at a Harjit Kaur Sidhu Memorial Program event at Surrey City hall on the evening of March 4. Those students who are currently enrolled in Punjabi classes can submit their essays to their teachers (who are then responsible for submitting them by the deadline); other students can forward their essays to the address given below. All submissions must be received on or before February 16. No exceptions will be made. Please submit essays to: Punjabi Competition, Asian Studies Dept. ; 1871 West Mall, UBC, Asian Centre V6T 1Z2. For further information, contact: Anne.Murphy@ubc.ca or sarbjit.randhawa@ubc.ca. Visit the Asian Centre foyer in the New Year for a new art exhibit featuring artworks by a UBC Asian Studies alumni. Summoning the Senses is a multi-media exhibit inspired by eighteen months of academic exchange and personal travels throughout India which aims to incite curiosity, encourage adventure, and bring vibrancy to winter’s wetness using sculpture, paintings, textiles, and unique modification of space with miscellanea. 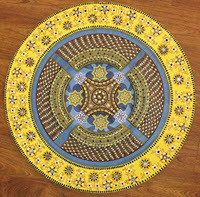 The heart of the display, an optically illusory mosaic sculpture made with thousands of spice seeds, has a mesmerizing allure rooted in the structure of mandalas and is centrally painted with Islamic geometric techniques. In the context of a wanderer’s eye passing through the kaleidoscopic Indian subcontinent, the exhibition ornately explores its diversity, the significance of the environment as it pertains to shaping agriculture and culture, and attempts to capture the dynamic process of learning and understanding through an abundance of senses. A recent graduate of UBC’s Asian Area Studies program, Amy Ebrahimian has nurtured a passion for visual arts alongside her education and is thrilled to be sharing her work with the students, staff, and visitors of the Asian Centre. Of German-Ukrainian heritage and raised in both the United States and Canada, her family has been on the move for several generations and the wandering rootlessness she has maintained has taken her across continents while studying (perhaps why it took a little more than eight years to complete her Bachelor’s degree). Her artistic practice is guided by a desire to cultivate and communicate an understanding of nature that can both expand the observer’s respect for its value and their motivation for its protection. Her process is a balance of free-flowing and systematic unfolding to depict natural elements, symbiotic relationships, and cycles in terms that are honest and relatable with a hint of the mystical. Joyfully compelled, she produces pieces in realistic, impressionistic, and abstract styles using scenery from firsthand encounters and dreams. Enlivened by the act of telling detailed stories and (un)tangling concepts, much of her current work features intricate arrangements of minutiae integrated with intense colour palettes into oil and acrylic, and is accented by a topographic maze of textures that tempts the eye into exploration. 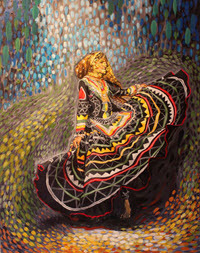 To learn more about the artist and her works, please visit www.mehndinomadic.com or Instagram @amy_ebrahimian_arts. 秩序的沦陷 : 抗战初期的江南五城 / (加)卜正民著 ; 潘敏译. 滴滴 : 分享经济改变中国 / 程维, 柳青等著 ; 张晓峰主编. 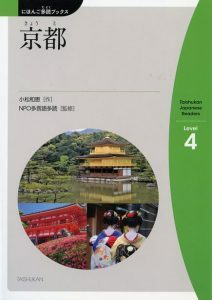 The recently upgraded Tadoku page has separate sections for the Graded Tadoku Readers (Nihongo yomuyomu bunko) and the Taishūkan Japanese Readers (Nihongo tadoku bukkusu), as well as a guide on “which reader is the right one for you,” based on the corresponding Japanese courses offered. Please contact the Japanese language librarian Naoko Kato at naoko.kato@ubc.ca if you have any comments or questions.